T he fresh breeze of the last century has put this small town on the map for its annual Artist Trail, its fresh produce grown along the seasonal Omaruru River and its wine, chocolate and cheese. A sunny day en route to the coast provided the perfect opportunity to veer off the main road, drive the extra 60 km and discover, explore… and taste. Rising with the birds, I had ample time to turn off from the B2 to Swakopmund and head to Omaruru to begin the day at Main Street Café, which is linked to a photo gallery and housed in the old bakery that has supplied Omaruru with fresh baked goods for 70 years. The menu revealed how ‘long-time residents remember the very colourful Baker Meyer and his Easter buns’. Focusing on using local ingredients, the Café boasts that it goes ‘days without opening a tin’ and bluntly states: ‘If you want Aromat, Ricoffy or margarine, please go up the street’. I was at the right place and sipped on a strong cup of coffee while I paged through history books, trying to gain a sense of the place before I turned my attention in a more gastronomic direction. Unknown to most, the town has a past that is deeply ingrained in the history of Namibia. Swedes were the leading traders and the largest foreign group in the country in the years between 1850 and 1880. Explorer and trader Charles John Andersson had established a trading post at Otjimbingwe in the 1860s. After his death in 1867, a new trading centre was opened in Omaruru by Axel Eriksson with Anders Ohlsson and Thure Een. Herero chief Christian Wilhelm Zeraua also moved from Otjimbingwe around this time making his home on the southern bank of the river, allocating the northern side to the traders and missionaries. A collection of chocolates at Dorgeloh. The Zanja Farmstall on the outskirts of town stocks a selection of homemade cheese, fresh farm bread, and jars of preserves. 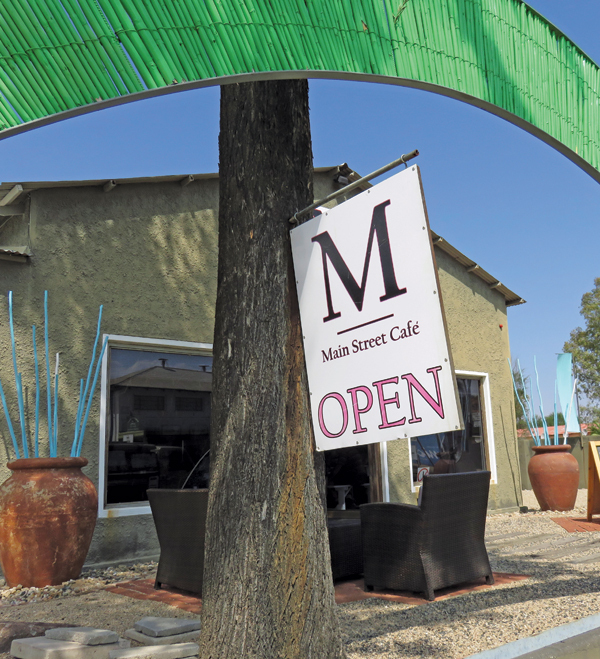 Main Street Café: ‘Local ingredients prepared fresh and served with a smile’. 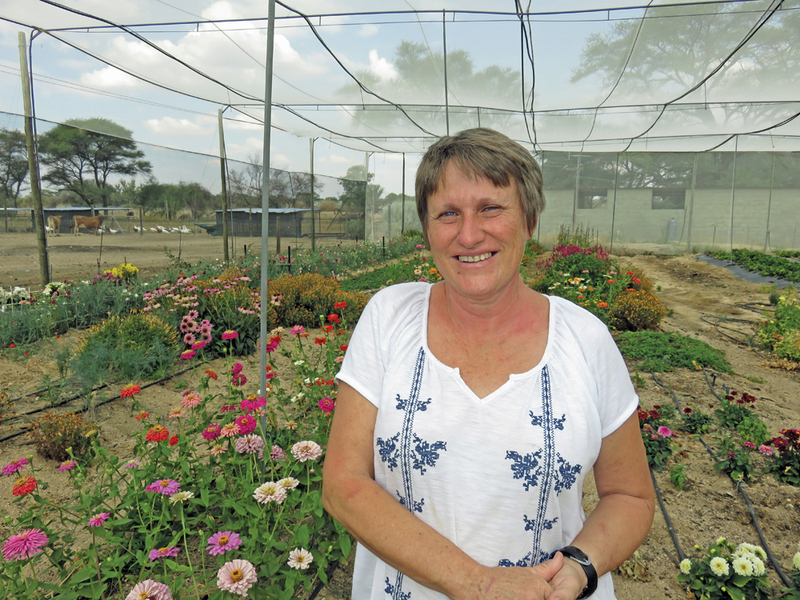 Local cheesemaker, Tinkie Cornelissen, in her greenhouse surrounded by flowers. 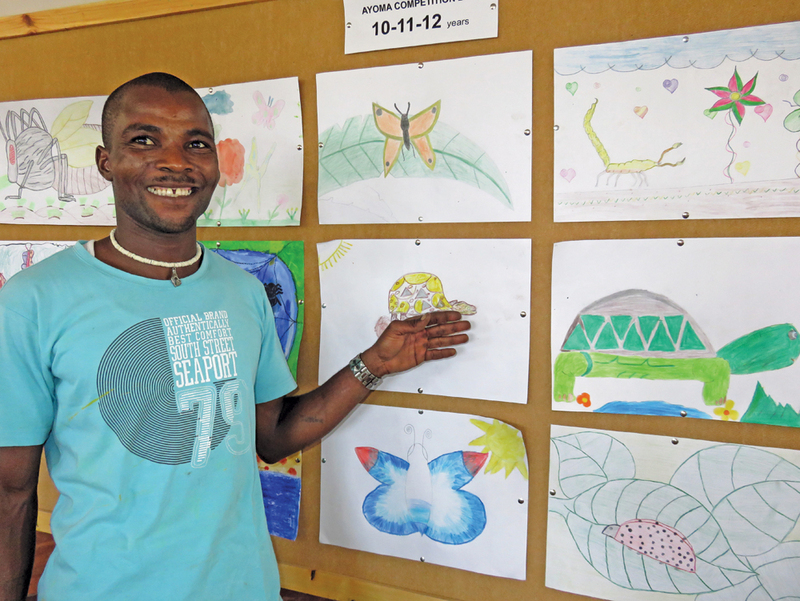 Teacher Raymond Haibeb at the Omaruru School of Arts. Time has buried most of the history, erasing virtually all traces under its sands. Today, all that’s left is the old mission house, now a museum (where Axel Eriksson and Fanny Stewardson had the first Christian wedding), the Evangelical Lutheran church, a small, disintegrating building called ‘Lindholm’s House’ and a few scattered graves in the old cemetery. The town, however, still retains its strong German flavour from the early 1900s. Omaruru slips in and out of history books in the twentieth century, the most notable incident being during the German-Herero war in 1904 when Captain Victor Franke, commander of the Omaruru Company, broke through a ring of Herero soldiers who had besieged the town. The watchtower built in 1907 was named Franke Tower in his honour. It was time to leave the history books, find the few remnants from the past and fill up on Omaruru delights. I drove down Wilhelm Zeraua Road, paid my respects to the chief in the cemetery before crossing the wide and dry (at this time of the year) Omaruru River onto Dr Ian Scheepers Street, to visit one of Namibia’s few wineries. Kristall Kellerei was originally started in 1990 by Helmut Kluge. His son studied viticulture in Stellenbosch and returned to the farm with the idea of trying to grow grapes. This was a challenge in the Namibian extremes where temperatures can soar into the 40s in summer and dip to -14˚ C in winter. The team was undeterred. The hardier cultivars were selected and – with a few tricks like using shade netting to provide relief from the heat and making fires in drums placed under the vines to ease the winter chill – the vineyards proved successful over the years. The winery and farm were taken over by Michael and Katrin Weder in 2008. Later on, in 2014, Olga Kausch took control of ‘the guest and gastronomy side’, i.e. the retail, wine-tasting and winery tours, as well as lunches. The delicious spread of cheese and meat platters, an assortment of salads and homemade bread is definitely a must to end off the wine-tasting in proper Omaruru style! Olga led us through the vineyards, her four dogs trailing after us, stopping to tell us (in both German and English) about the grapes and how the high temperatures mean a high sugar content and early harvest, with the white (i.e. Colombard) usually harvested in January and the reds in March. 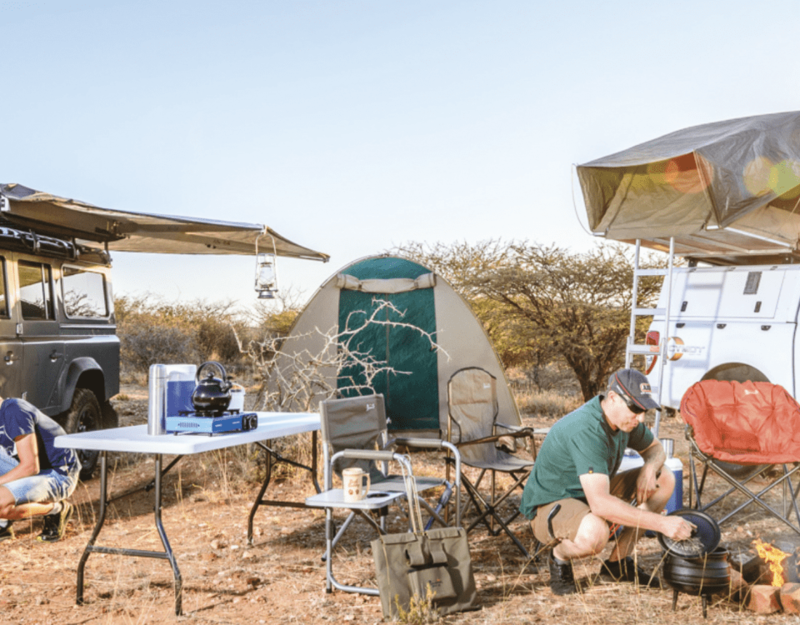 An environmentally-friendly enterprise, Kristall Kellerei uses drip irrigation in the late afternoon to conserve water, and with no threat of fungi or mildew developing in the Namibian heat there is no need for pesticides. Even the larger pests, like porcupines, are caught in traps and released further away, and the bokkies (the small antelopes like Damara dik-dik and steenbok) that like to nibble on the fruit are gently chased away. Vineyards merge with the prickly pear fields where Olga told us how schnapps plays a large part in the winery, with monkey orange and prickly pear distilled on the farm in Omaruru and date and pomegranate at Naute Kristall, their new distillery at Naute Dam en route to the Fish River Canyon. This is where they also distil the first Namibia gin – infused with devil’s claw! And that seemed to sum up the essence of Omaruru, where food is locally produced and ‘lekker’ -the descriptive Afrikaans word for ‘good’ or ‘delicious’ that is used to describe everything from food to the glorious day. I met the local cheese maker, Tinkie Cornelissen, on her farm on the outskirts of Omaruru. While her husband tends to the animals, Tinkie grows flowers, makes cheese, bakes bread and pickles or preserves anything from jalapeños to beetroot. “It’s just everything that you can produce on a farm,” she explained humbly when I looked at her in amazement, realising that she is more productive than most of us are in a lifetime! From Tinkie I learnt about small-town charm. She delivers fresh bread and her cheeses to the Onyati butchery (and farm stall), and fresh flowers, milk and butter to the pharmacy, which acts as a central outlet. 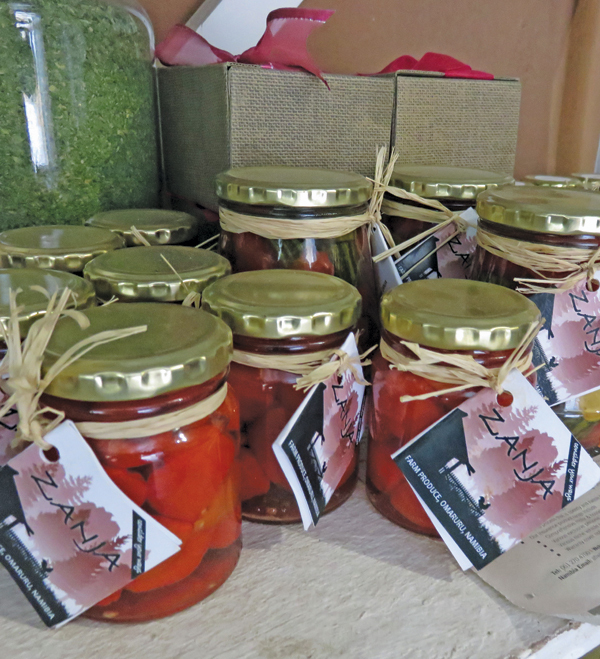 She also sells her products at the farmers’ market every second Saturday, on the Artist Trail in September and at her farm stall (6 km from the town). On a walk to the greenhouse, past the cows, turkeys and chickens waiting for their afternoon feed, Tinkie explained that the farm is as organic as possible, with no fertilisers or pesticides used except, on occasion, for the roses. Instead, companion planting is the preferred means to deter pests on the flowers and herbs, and the turkeys are the natural ‘pest control’, allowed in every now and then (under close supervision) to peck off the few caterpillars and bugs. I left the farm laden with smoked mozzarella; a snack pack of feta, sundried tomatoes and olives; bottles of pickled chilli; rose jam – and a warm feeling inside. 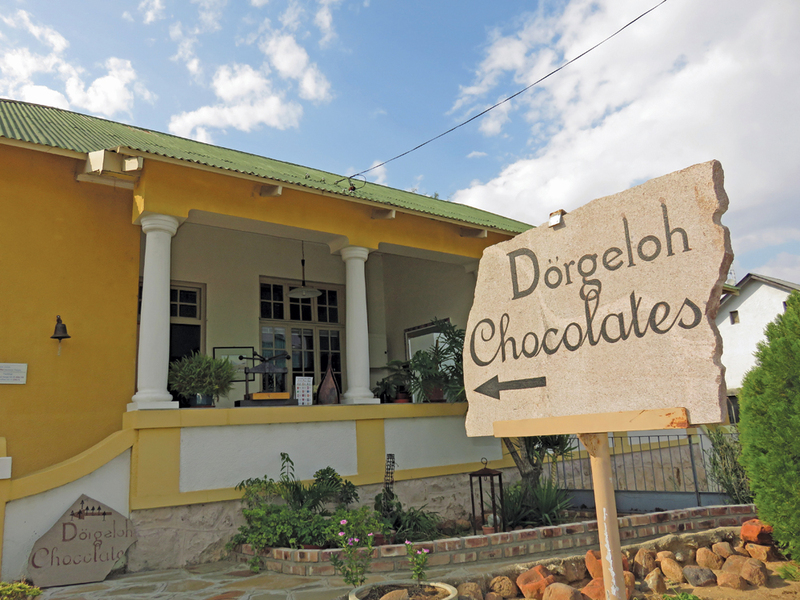 There was still time for one more tasting to place the cherry on the top before I headed westward: chocolate at Dörgeloh Chocolates. It added a delicious and colourful end to an enjoyable and worthwhile detour to Omaruru, leaving a sweet taste with me that mingled and lingered pleasantly with the dollop of intriguing history, friendly townsfolk and delicious fare. Omaruru is always a worthwhile place to include in your route from Windhoek to Swakopmund, Brandberg, Twyfelfontein and Etosha. You may want to spend a night – or two – at one of the guesthouses or B&B’s. 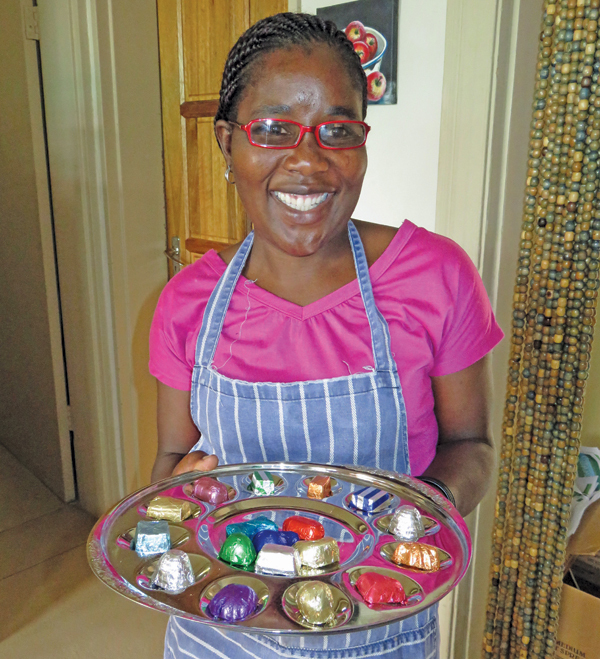 Be sure to drop in at the bright yellow house on Kerk Street for a chocolate tasting. The word ‘omaruru’ stems from the Otjiherero word meaning ‘bitter milk’, supposedly referring to the bitter milk the cows produce when they browse on a local bush.